Try a pen that's a little different and something people will remember. Production time: Usually 3-5 Working days after artwork approval. If you need them sooner please ask, we will try to help! Please select more products or proceed to cart to order now. These pens are great for the planet and feature the very popular ergonomic design Aussies love. 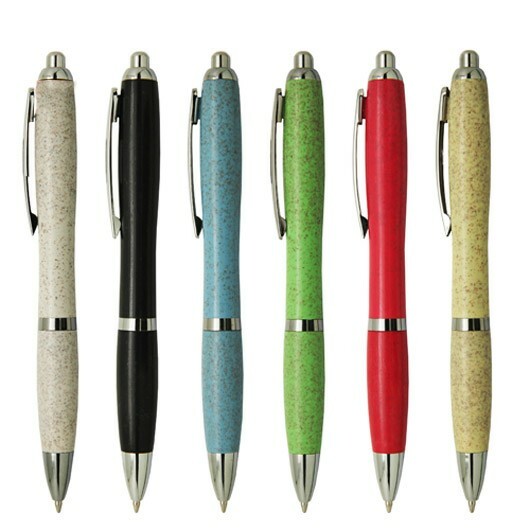 Made from left over stalks from harvested wheat these pens are made from 100% renewable and biodegradable material. It's great for the environment by reducing the amount of plastic used and puts your organisation in a good light. The pens have click action functionality with 1200m of black German ink and a tungsten carbide ball for superior writing quality. A 'virtual sample' is a high grade PDF file showing your logo on your chosen product. One of our design wizards will take the time to obtain your logo, fix it up if needed, and then carefully position it on a photo of your item. This gives you a great indication of the outcome you can expect from your chosen promotional merchandise or clothing! When you place an order with us you will get a virtual sample as part of your proof before the product goes into production. We only decorate a product with your authority and approval. It costs us about $30 to produce a virtual sample so unfortunately if you only require $240 worth of pens it's uneconomic for us to do one of these for your free of charge before your order - sorry! (but you will get one as part of your order). We will email you a PDF showing the product that you want with your logo mocked-up on it. This is NOT a proof, there is NO obligation from you to buy, this service is FREE. The better your logo quality and instructions, the better the quality of the mock-up. The graphics guys might have a question for you so your name and number are good too! Instead of a ‘normal’ quote we can send you one that features your logo mock-up. This is great for persuading others that you have found THE product for the promotion! *Account Managers are allocated automatically to you when you request a quote from us. They are your one point of contact and are here to help you quickly and efficiently. **If you do not have art in these formats there may be delays in getting you a high quality virtuals sample. Unfortunately we do not offer free virtual samples on under $100 worth of product. Promotion Products leads the market in Making Merchandise Happen – quickly! If you have a tight delivery time frame we will bend-over backwards to make it happen. Call us right now on 1300 303 717 – tell us what you need, where and when and we will give solid advice if it can be done. When you go through the quote feature ‘Price Your Custom Item’ above right from here you will be shown production time…you can also search for products by production time frame in our search filters. 1/ Production time does not include delivery time. Darwin is further from our dispatch points (mainly Sydney, Melbourne and Brisbane) than say Newcastle, our orders are usually bulk consignments so have to go by courier. Our staff can give you delivery time estimates. 2/ All products are custom made and decorated so we can’t send them the same day! Production time starts after we have received your order, artwork, proof approval and payment. If it can be done we will do it. 1/ Discounting. If your club or charity requires pricing support we will give what we can... we can’t discount everything but we can discount many items. Please ask us. 2/ Free Products: A Helping Hand We have just launched a new program designed to give special organisations a helping hand. 'A Hand-Up' is a program that you can apply to. Read about how we can help your Charity, Club, School or NFP here. We like to help those that help others so please get in touch!